We are a consumer society and that brings with it waste. On average, a ton of waste is collected from every household every year. And that’s already an improvement! Once we’ve thrown things into our bins, they become out of sight and out of mind. Unless of course the necessary processing, recycling or landfill site is threatened to arrive in our neighbourhood. As a member of the team accompanying the Green Ventures Mission to the UK from Germany, it was a real opportunity to look behind the scenes of two totally different recycling plants. You certainly can’t get more emotive than an incinerator. Especially when it’s one of the largest in Europe and is situated within the M25 corridor. The reality is that even with the ever increasing separation of waste into recyclables, there is still going to be a residue of black bin waste that is either destined for landfill or incineration. Wearing a yellow high visibility jackets and facemasks, we followed our guide on the tour. Waste lorries were arriving at regular intervals, weighed as they went in and weighed as they went out. We began to appreciate why this flow required a facility of Brobdingnagian proportions. After climbing flights of stairs, we could look down into a gigantic hall with cavernous bays that dwarfed the vehicles beneath. Further on, giant claws grasped ton quantities of waste out of immense storage pits. They manoeuvred over concrete funnels and dropped the load that would then be fed via conveyer belts into the incinerator. Coming to a platform several levels above the floor, you could feel the residual heat escaping behind us through the walls from the furnaces as we peered down into the turbine hall. 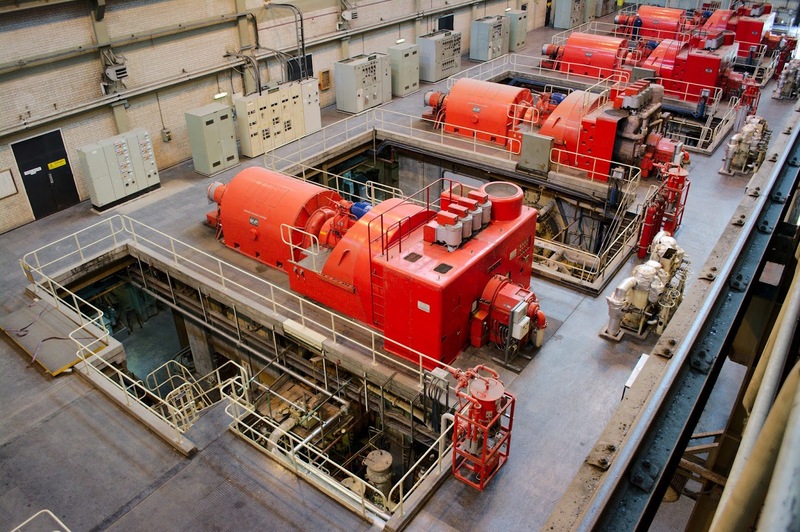 A row of brightly red painted turbines, each capable of generating more than 12 MW of power, seemed small compared to the hall, yet would easily dwarf a man. At first, entering the control room seemed like a time warp, the original 1970s control cabinets still in place. But when you got to the control centre, the 21st century with its flat screens and digital controls was apparent. We learnt that whilst the plant might look like a dinosaur, it had been refurbished and brought up to the highest specification. It would not only incinerate the waste, but also cool and scrub the fiery exhaust to remove the major remaining pollutants. The final gases released were predominantly water vapour and CO2. Built to last, this plant could continue till the mid 2020s. We could very clearly see the set emission limits and monitor the real-time levels of emissions from the furnace prior to scrubbing. The plant was working well within its limits. There were plans in place to link the waste heat to a new nearby development, to provide heating and hot water. The residue after incineration was a granular ash, a significantly smaller and sterilised bulk compared to the odious waste that had been the starting material. I left the facility deeply impressed. The delegation also visited the AmeyCespa East site, north of Cambridge. It used to be a purely landfill site. Now, landfill is just a small proportion of the waste handling facility. 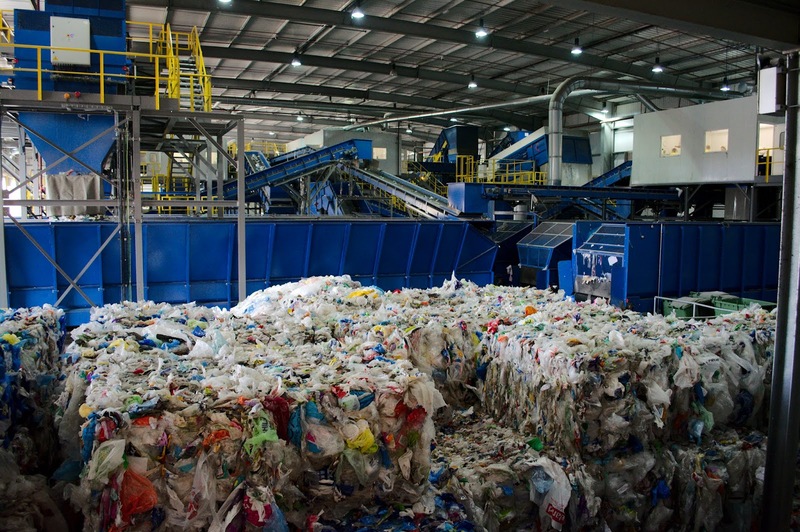 200,000 tonnes of Cambridgeshire’s waste is handled at the facility. In the past decade there has been a considerable effort by the county council to introduce waste sorting into appropriate bins to enable recycling. Our household in Milton for example has three bins, green for garden and food waste, blue for metals, plastics, cardboard and other packaging, with a separate tray for quality paper, and a black bin for the remainder. 1. Items too bulky to pass along the conveyor belts of the sorting system. 2. Old VHS tapes that unravel and tie up the cogs in the system. 3. Plastic bags. The thin, low grade plastic made them unattractive economically. Bales made from the millions of plastic bags in everyday use accumulated in a corner of the hall. I’ve previously seen the composting of the organic waste from the green bins, which generates a high quality compost that can be collected free by local residents or that is passed on to farmers. The whole process is self-sterilising and green. There was not enough time to visit that part of the site. As with London, the remaining issue is the black bin waste. Potentially hazardous, containing items such as bags of dog muck or rotting food in packages, this waste had to be handled carefully and away from human contact. Instead of incineration, this waste was treated by “composting”. The waste was delivered at one end of a closed and environmentally controlled hall, away from human contact. The decay and fermentation of the organic materials within the waste raised the temperature of the material. Over a matter of weeks, the waste was moved gradually from one end of the giant wall to the other, becoming sterilised in the process. By the time it reached the other end of the hall it was also dried out. What remained was dramatically reduced in bulk and could be sorted to some degree. However the value of metals and plastics derived from this dirty source was much lower than that from the clean material recycling. Any residue left over was passed on to landfill. The impact of environmental legislation and the rising costs of landfill have brought about a sea change in the UK in attitudes towards waste, recycling and recovery. The two facilities we visited were particularly good examples of recycling a significant proportion of domestic waste. Within the UK, over 40% of household waste is recycled, meeting the EU targets that are becoming ever more stringent. The sites we visited had a much better rate. However, nationally we lag behind the best performers such as Germany (62% recycled), Austria (63%), Belgium (58 %), the Netherlands (51 %) and Switzerland (51 %). With education and changing attitudes, we can look forward a continuation of the dramatic change attitudes in the UK. The key switch will be when the majority don’t see waste, they see material to be recycled and recovered.